The sharp-eyed reader may notice that there are some tomatoes in amongst the bounty. There may not be many more, unfortunately, as the majority of the tomato plants have not recovered from their earlier dowsing and are now dead or dying. The weather has not been kind: more rain fell while we were away and the lower vegetable garden is still under water. I had to throw all my Florence fennel plants onto the compost heap as they had rotted and died (shame they weren't Venetian fennel, eh?). The peppers are clinging on to life, but only just, and even the rhubarb is looking a bit sad. The contrast with last summer's drought is so extreme that I feel it is deliberate. Maybe next year we'll be shown the happy medium. There were the usual overgrown gherkins and zucchini (is it OK if I just call them zucchini now? Calling them courgettes/zucchini is cumbersome.) and lots of beans. Before we went away I'd been picking the yellow wax ones, but now we've got the (green) Blue Lake bush beans and the first runner beans (Wisley Magic), too. All the beans went into the freezer this afternoon, except for a few of the Blue Lake ones which went (with cucumber and tomatoes) into a Salade Niçoise for supper. 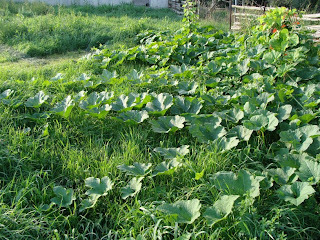 The wet weather may have been lethal for some vegetables, but it has been great for the cucurbit family. I never used to like cucumbers much, but the Telegraph Improved variety that I've been harvesting taste wonderful - much sweeter and more flavourful than anything I've ever bought from a store. I always thought that the 'home-grown tastes so much better than shop-bought' hype was a bit over-stated, but it really is true with cucumbers. 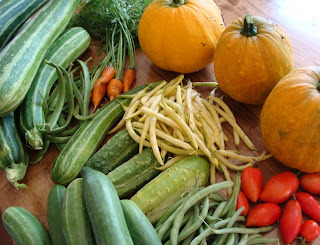 The winter squash shown here are Small Wonder spaghetti squash (on the left) and two Winter Luxury pie pumpkins. I'm really proud of those (my first-ever winter squash) and am particularly pleased with them because they don't need processing immediately, unlike nearly everything else. The plants are enormous and look like something from outer space, the way they're spreading over the upper vegetable garden. Getting through them to pick the runner beans is a precision exercise. Hope you had a nice trip. I'm envious of your veggies. Should have planted some. But I live in a garden home, and only really garden on the east side, so there's not a lot of room. Have to be container veggies, I s'pose. What a great collection - worth coming home for - it looks delicious! Flood or drought those courgettes keep on growing and growing. Amazing how fast things seem to grow when you go away.